In case you didn’t already know, today is Canadian Thanksgiving! 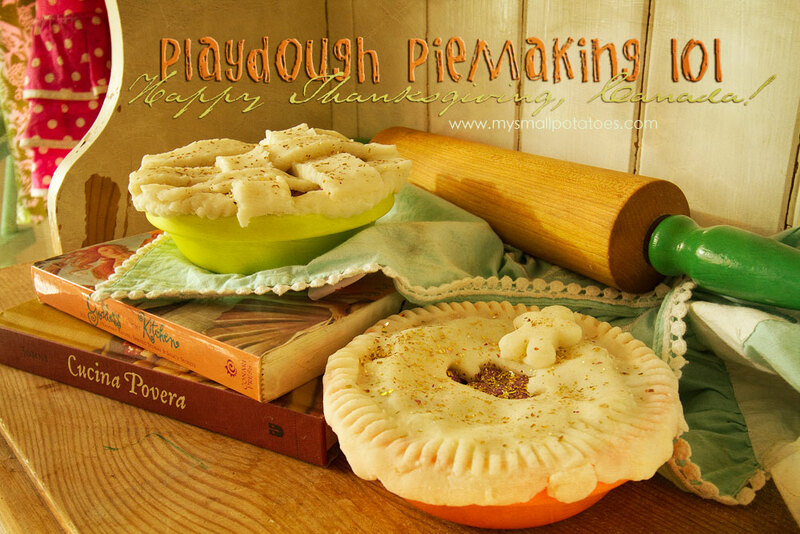 And what better way to celebrate this holiday than with pie making!! 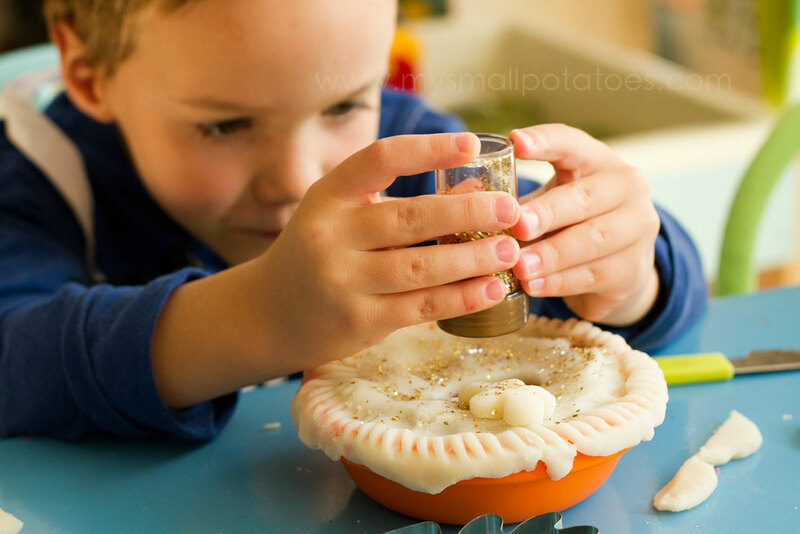 My kids always want to help with making pies on Thanksgiving. They love to get involved. So this year, I wanted them to be able to be MORE than just involved. 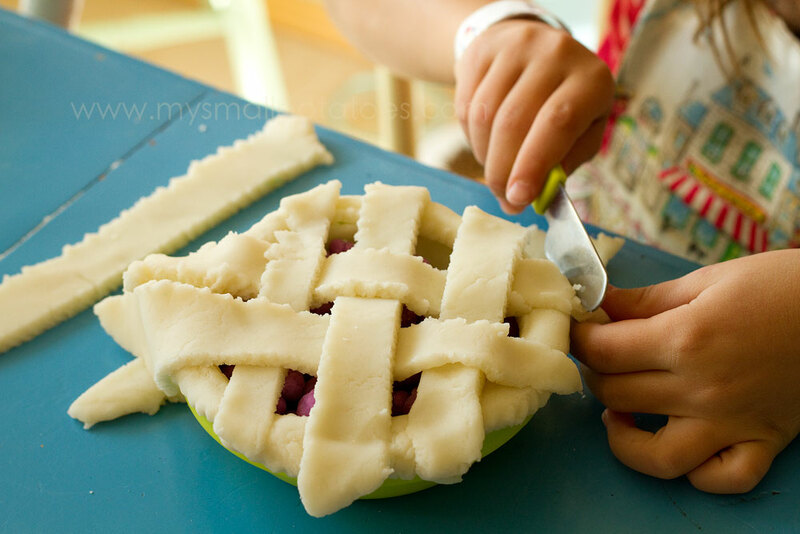 I wanted them to be able to handle every step to pie assembly. 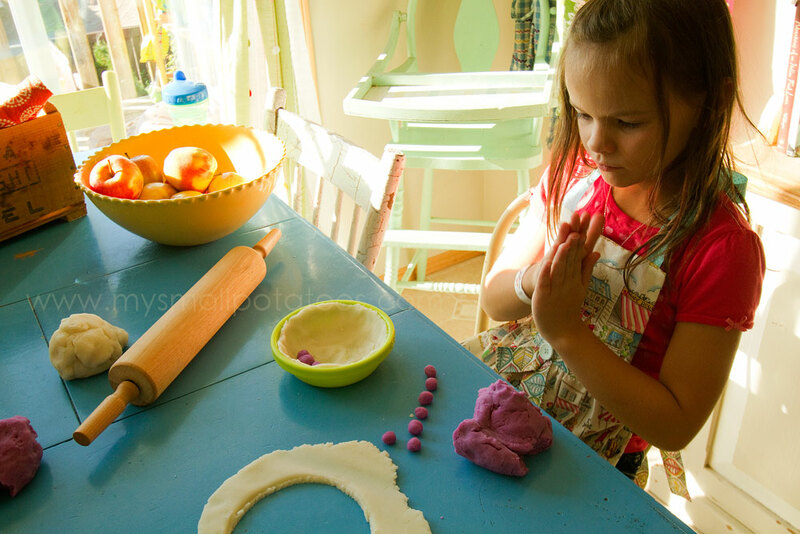 But they needed practice so they’d feel confident…so we did a practice run with playdough! *Warning: this post is very photo-heavy. 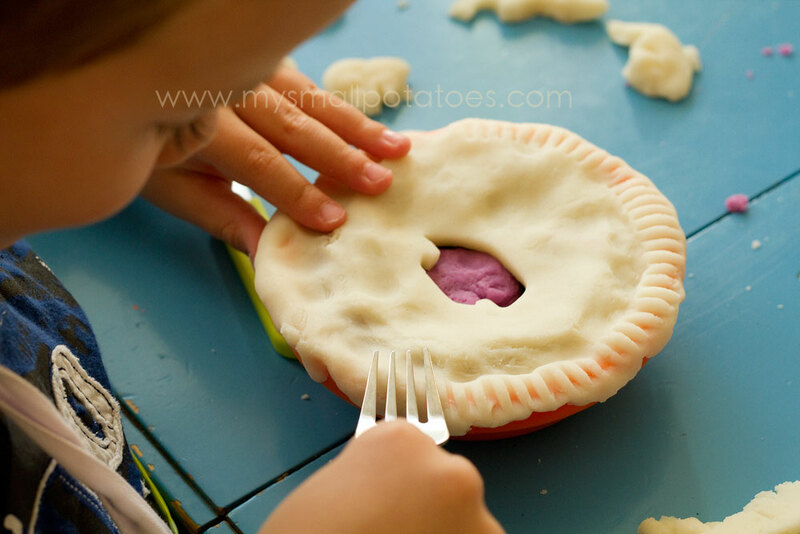 I wanted to illustrate to you just how many opportunities for fine-motor practice and cognitive development there is in making a simple pie. In almost every photo, there is a skill. And my boy and girl had no idea they were working…this is the beauty of play!There are so many things being learned and it doesn’t feel like homework! So let’s get started. 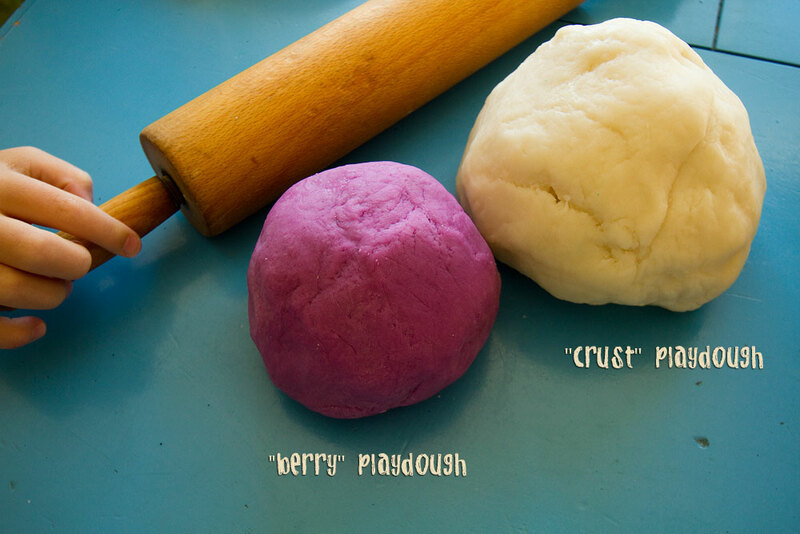 I made 2 different colours of playdough… You can make as many “pie filling” colours as you would like! There are so many possibilities. 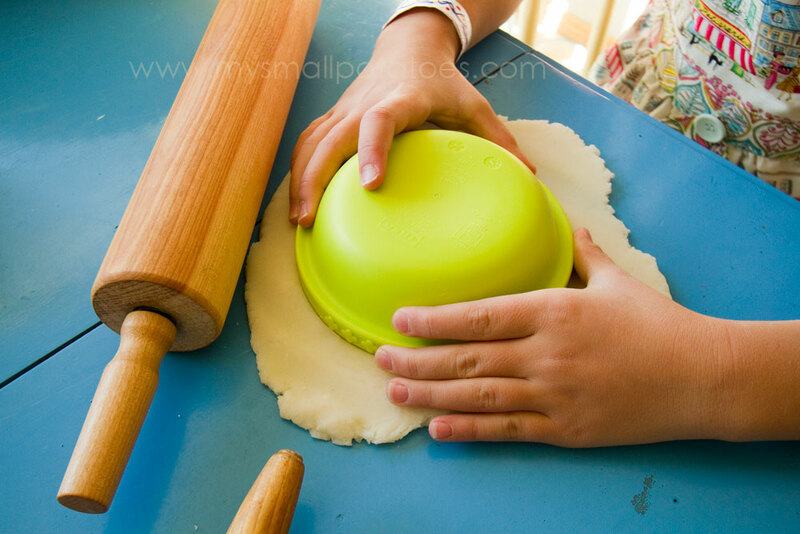 We started out with rolling out our bottom crust… Once the dough was rolled out, we measured the crust with our pie dishes… The kids each trimmed their crust to fit. One used a knife… And the other used a technique he’d thought of all on his own…just rip! 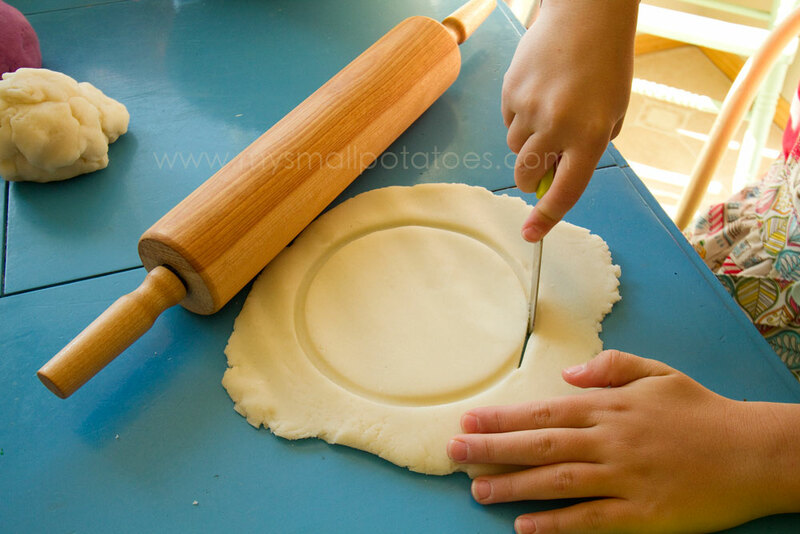 Once the crusts were measured, the kids pressed their dough into the dishes and they were ready to fill up their pies! They rolled berry after berry and placed them into their pie shells. There was no worry about the size of the berries or even the shape. 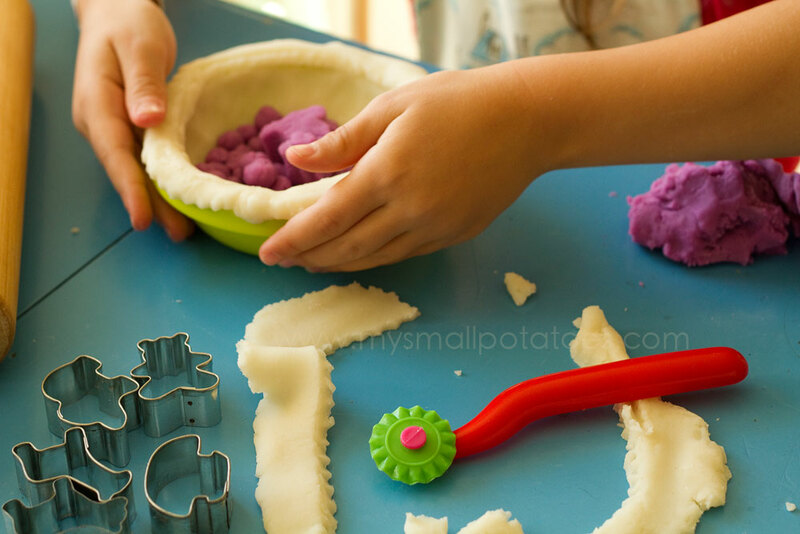 This playdough pie-making should be fun, not a chore. We counted berries as they went into the shells, and we estimated how many berries we thought it would take to fill the shells. 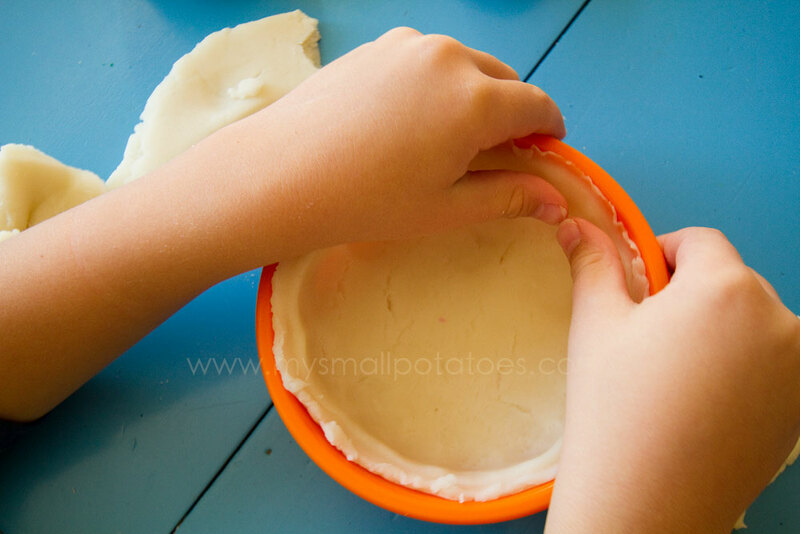 All this fine-motor practice AND math work in the simple art of making pie! 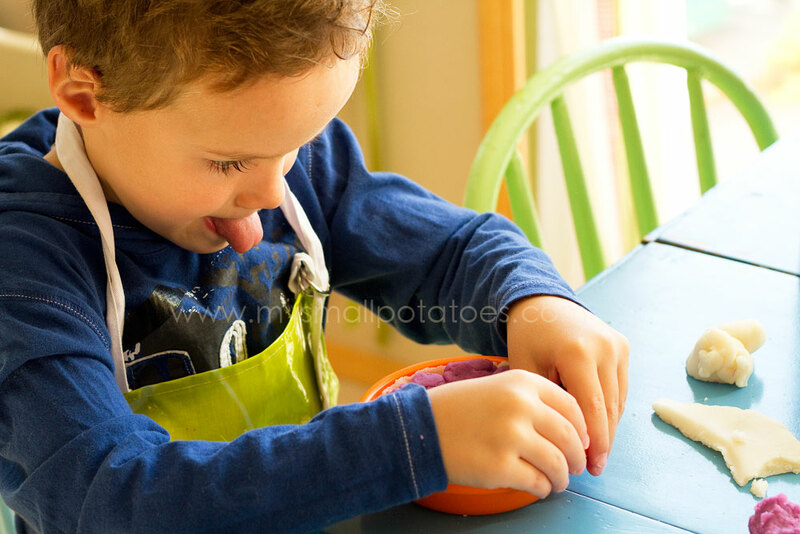 Not to mention the concentration and focus needed… That photograph makes me giggle every time I look at it! 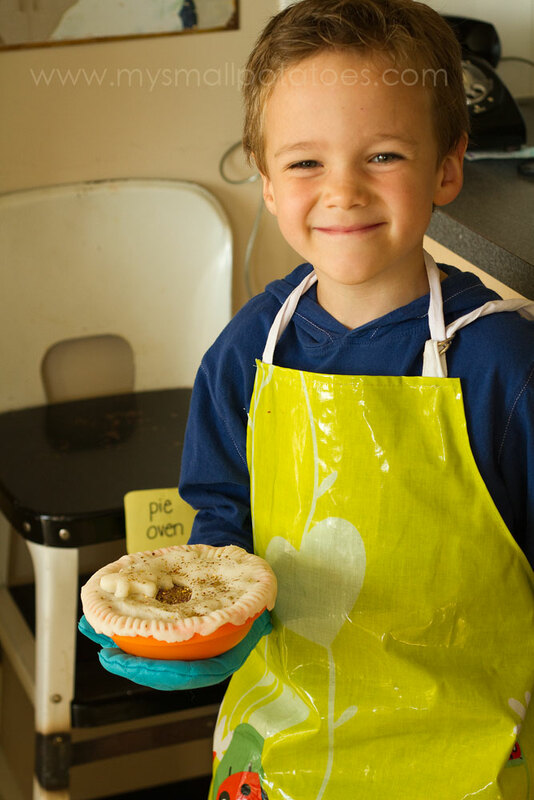 Our pies were finally filled with fruity goodness, so it was time to create the top crust… I encouraged the kids to decorate their top crusts as they pleased. 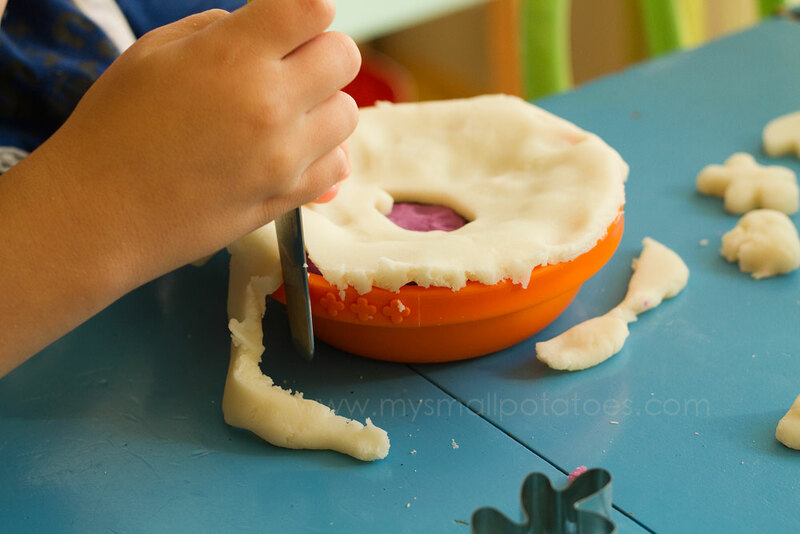 I provided cookie cutters and a pastry slicer for them to use. 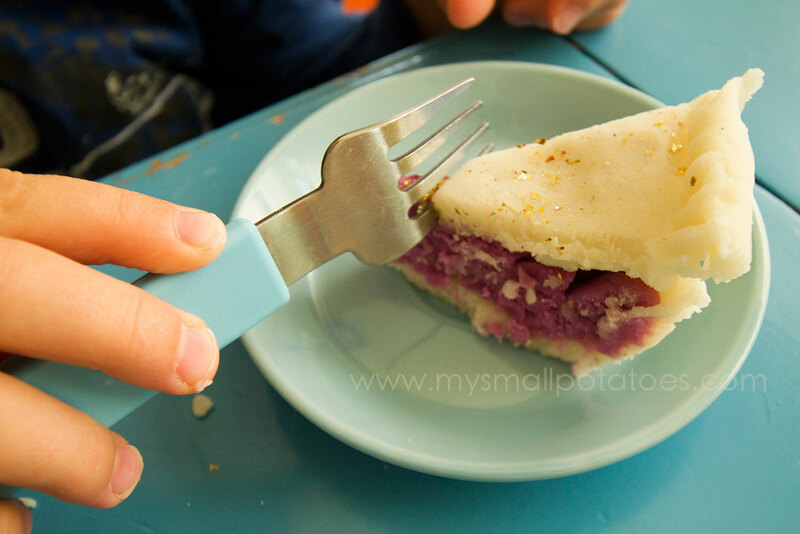 Once the topper was on, I gave my boy a child’s knife to trim the edge of his pie. 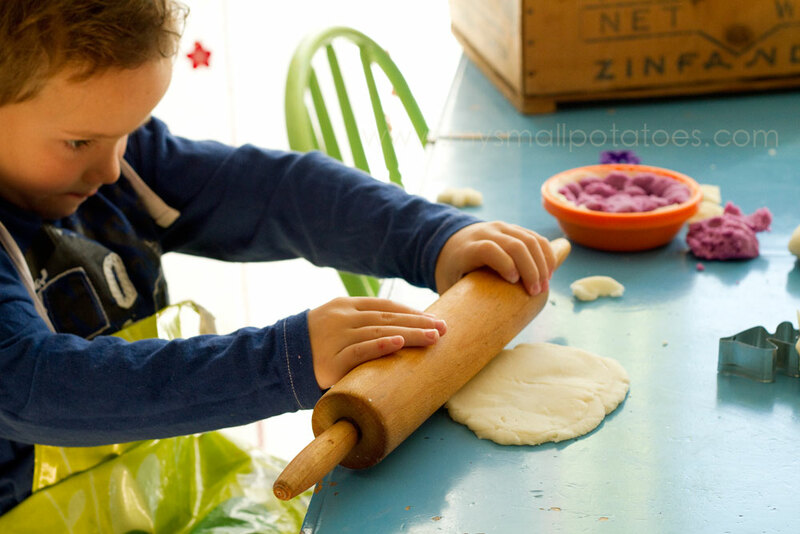 I showed him how at first, and then he was away… He wanted to edge his pie like his Gramma does, so I gave him a fork and he pressed all the edges… He added a bit of “sugar” sprinkles from the glitter shaker… His was ready for the oven! Coco wanted to make a “criss-cross” pie. She is 7, so I figured she could handle it. I instructed her to cut strips from her topper crust and I would show her how to weave them. Let’s just stop for a minute and think about what Coco is learning here. She is keeping her knife going in a straight line…this is serious eye-hand coordination. She is also “measuring” in her mind, keeping each strip relatively the same width as she cuts. 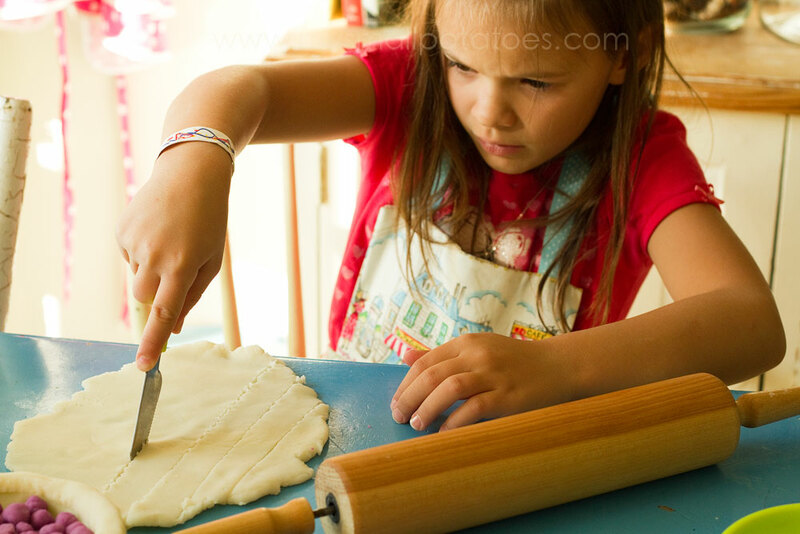 She is holding her knife with just enough pressure to cut through, but not mangle her dough. The girl’s mind is working overtime and she is enjoying it! Lickety-split, she had the weaving done…and I might mention she was SUPER proud of herself. 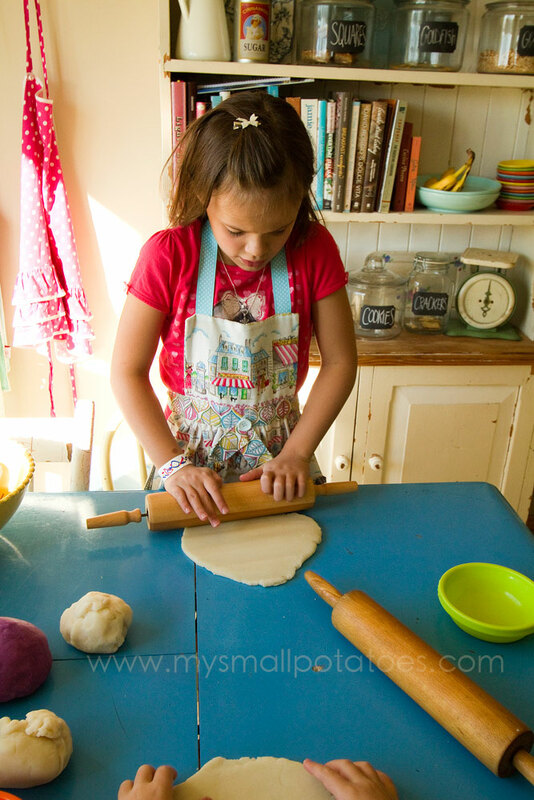 She trimmed the edges and her pie was also ready for the oven… The two kids decided that our kitchen telephone stool would make a great pie oven, as the steps slide in and out just like an oven rack! 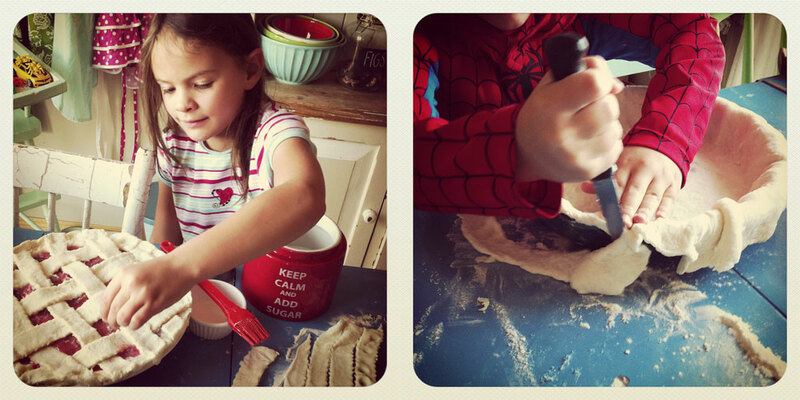 Such a proud little baker… Now the only thing left to do is eat! My two little ones yesterday, making REAL pies for Thanksgiving dinner (from my iphone)… Happy Thanksgiving to all my Canadian readers!! This is lovely and so lots of fun! 🙂 I never bake a pie or try one (not a local menu in my place), I might try one someday. Such a wonderful idea. 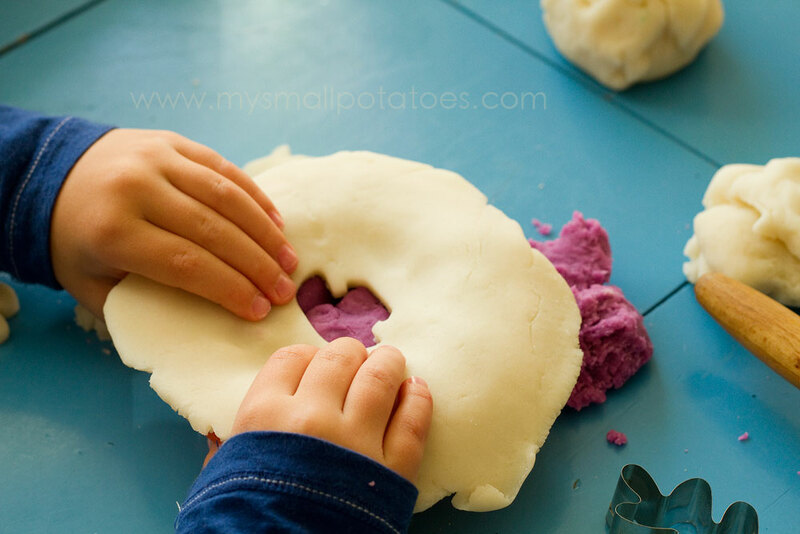 Its ages since I last played around with play-dough (like say 28 years), so I must try this now with my kids. Thanks for reminding me of playdough! Wow, they really do look good enough to eat. 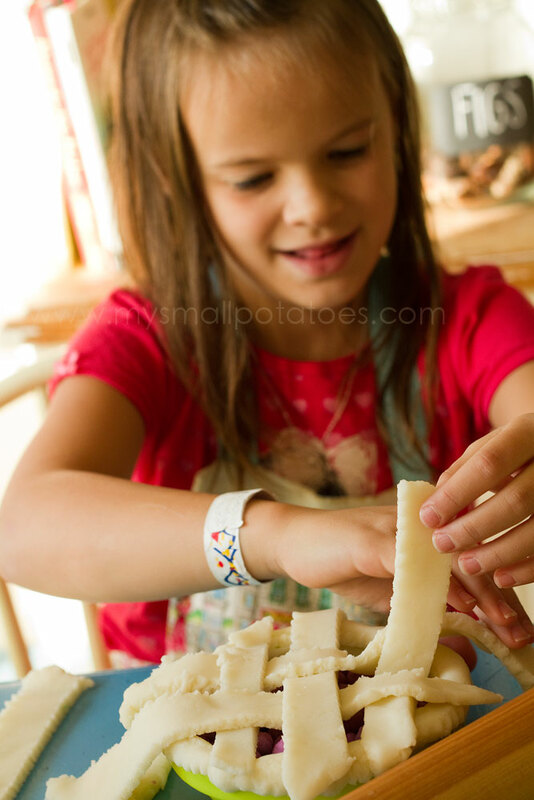 Great skills for mini chefs in training! 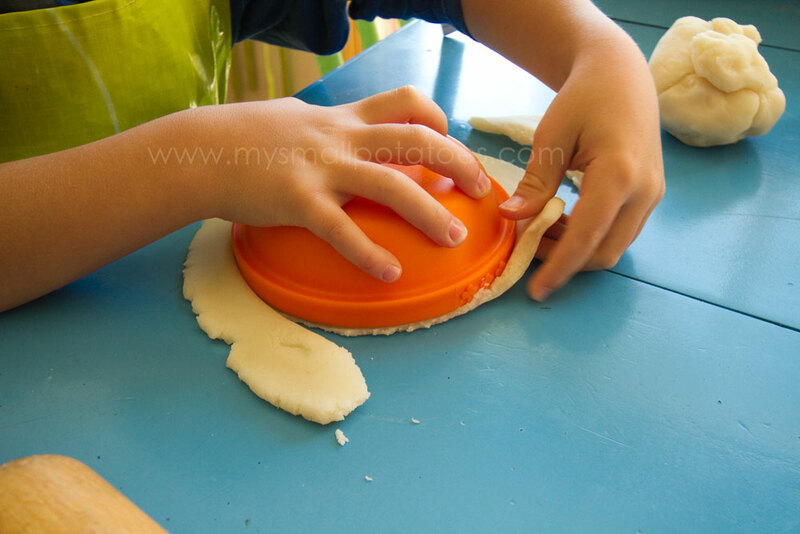 What play dough recipe did you use???? 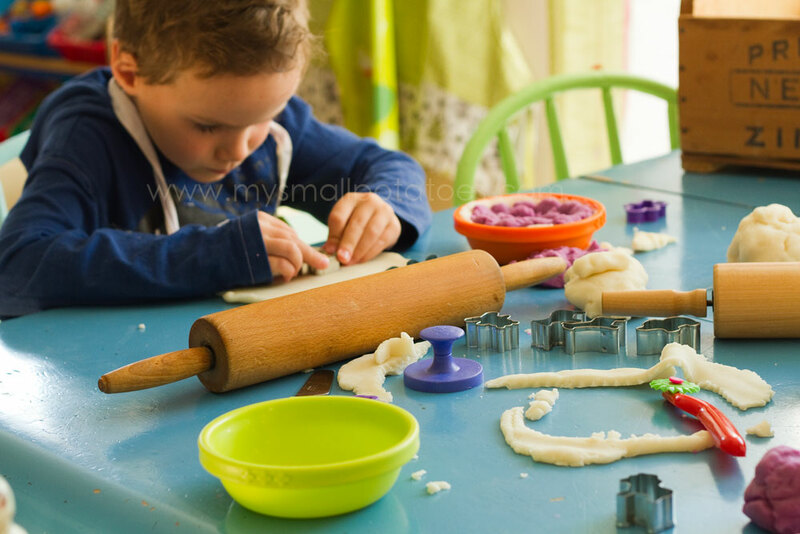 You’ll find a version of our play dough recipe in this post…just omit the spices and add whichever colouring you would like!